← Meet New ASCB Vendor, Julia Walther! 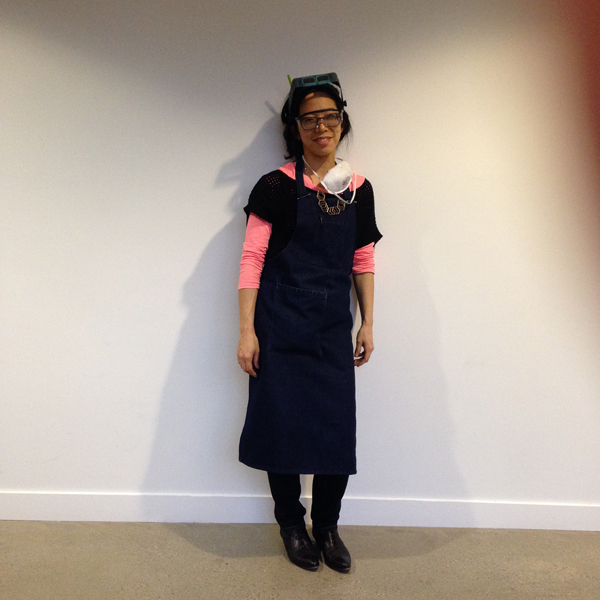 Meet New ASCB Vendor, Emiko Shinozaki! After a lifetime of playing and teaching, I put down my violin for the last time in 2006. I felt I was finished with the musical chapter of my life, but I had always made a living working with my hands. I felt a need to explore what I could do with them next. 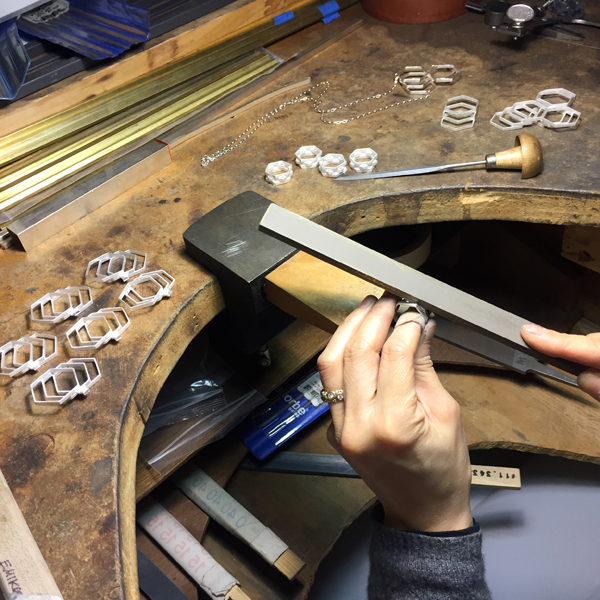 It wasn’t until I started working with brass, silver, fire, hammer, file and wax that the instruments of my future began coming to life before my eyes. I had transitioned from the ephemera of musical performance to the permanence of metals, and it was intoxicating. I could hold my creations in my hands. I could wear what I imagined. I was in love again. Architecture, music as math, chemistry, and symmetry–all my old flames– inexorably find their way into my work. 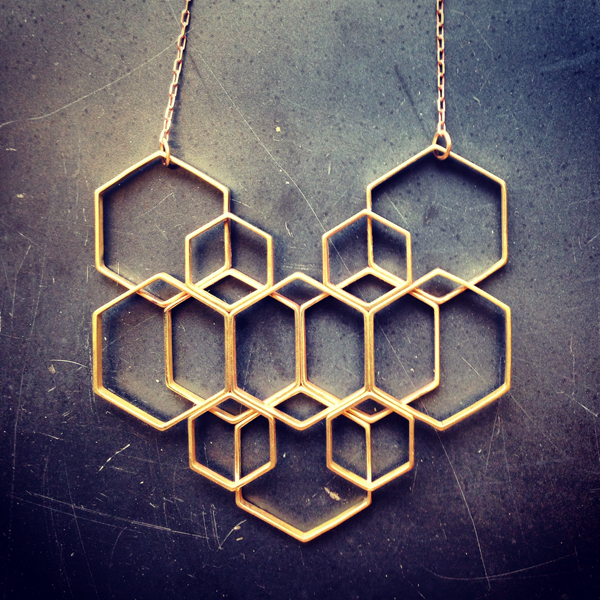 I spend hours soldering and chasing flux through the narrow channels between my hexagons. 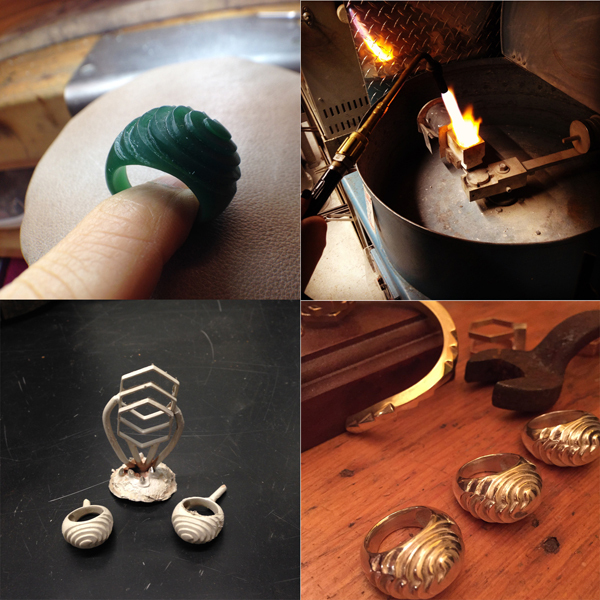 Days fly by as I work out the kinks of an intricate piece of casting. Every method has its advantages and demands. To cast or not to cast? Precision soldering and cleanup versus casting and yet more cleanup? Doing things the hard way has its rewards. 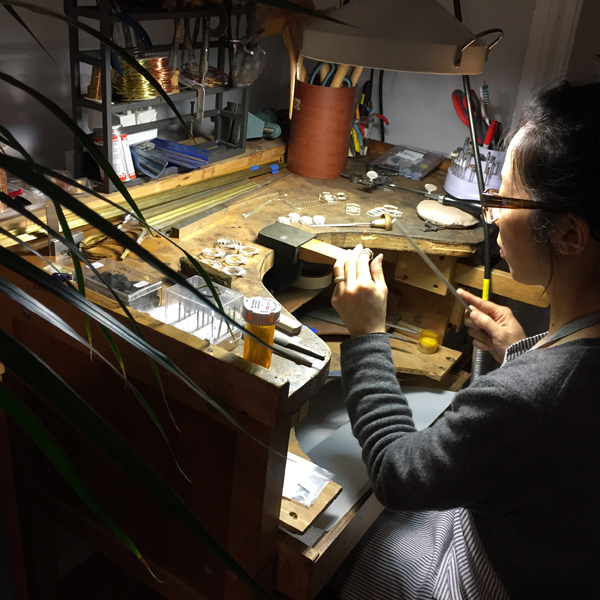 I handcraft each and every piece of jewelry myself for Emiko Shinozaki Jewelry and I don’t do e-commerce. Why? Because I want each piece to be unique, and I enjoy meeting the people who will ultimately wear my pieces. What that means is that I don’t really have a complete ’system ’ in place for manufacture or distribution. The exciting part is that I’m still learning with each piece I make and every client I come in contact with. I continue my tradition of teaching and learning, this time with family and colleagues, as it’s the best way I know how to enjoy life. I have an unending attraction to the physical changes that brass undergoes when thousands of degrees hit it. My necklace creations have intrinsic “torch marks” that deepen with age, lending depth and 3-dimensionality to an otherwise humble material. One of my necklaces can have upwards of 100 solder connections, sometimes less, sometimes more. 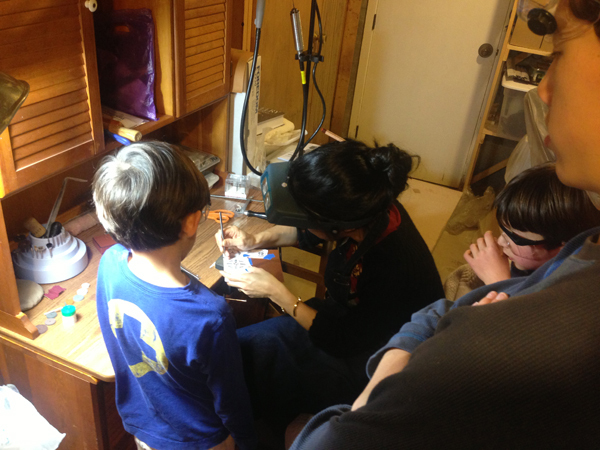 As I’ve expanded my offerings, I’ve found the best 18K gold-platers in NYC and learned to make molds & cast silver with the lost-wax method. 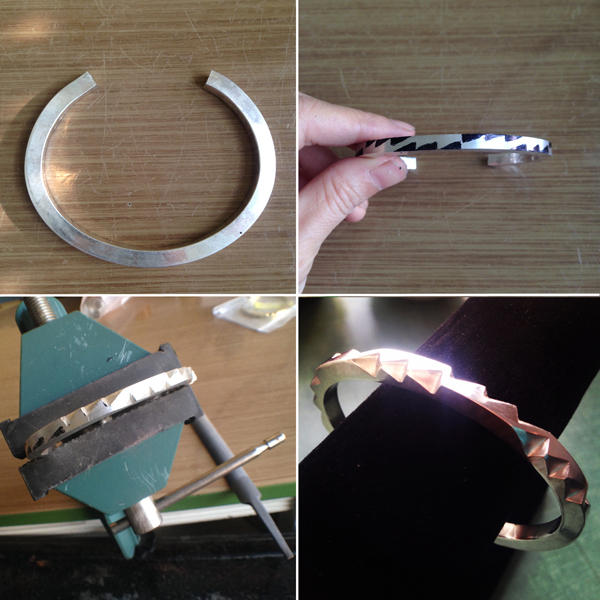 Each silver or brass Alt-triangle bracelet is hand formed, filed and finished, taking many careful hours from start to finish. 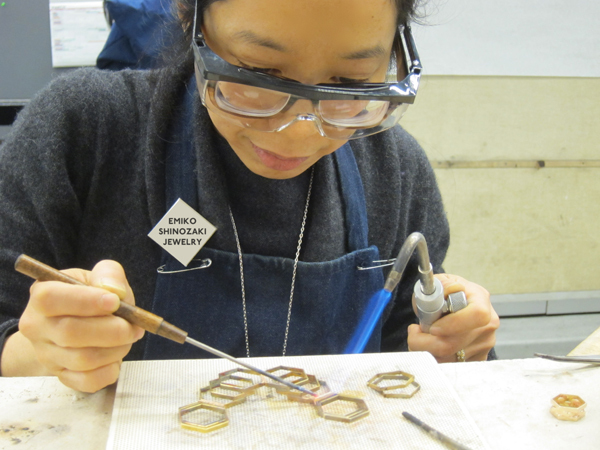 These days I look at my hands and wonder at what jewelry-making has yet to teach me. 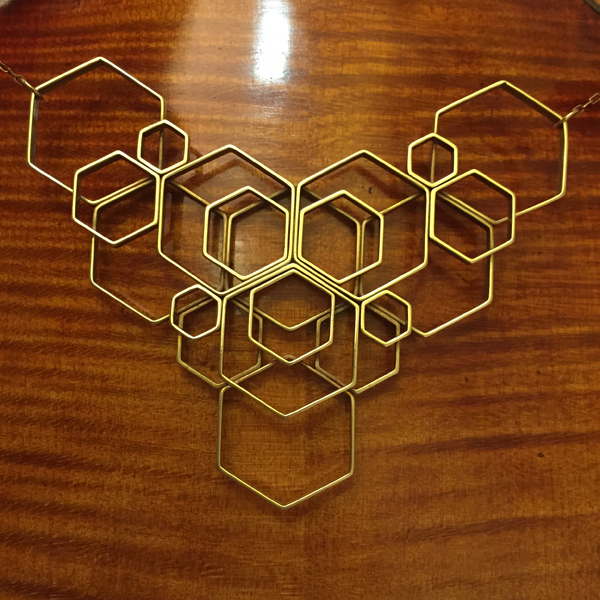 This entry was posted in ascb and tagged art, art star, art star craft bazaar, artstarphilly, brass, casting, craft, Emiko Shinozaki Jewelry, Festival, great plaza, handmade, hexagon, honeycomb, indie, penn's landing, philly, show, solder. Bookmark the permalink.